Chania (pronounced “Hanya”) must be the loveliest port town in Greece. Swallows soar in sheer blue skies above the semicircle of tall Venetian houses around its picture-perfect Old Harbour. The tables of scores of bars and restaurants line the quayside. Behind the harbour front, narrow, traffic-free shopping lanes thread through the atmospheric Old Town. On either side of the town, sandy beaches stretch along the coast. Population: 53,910 in the town and 70,000 in the greater Chania area. Opening hours: Traditional local shop hours are generally open Monday to Saturday from 8 am to 2.30 pm, and also from 5 pm to 8 pm on Tuesdays and Thursdays. Shops catering mainly to tourists are usually open every day of the week from 9 am–10 pm. Chania has a plethora of pursuits to offer you holidaymakers. Start with a stroll along the historic harbour, then go on a glass-bottom boat cruise and enjoy the wonderful sea life, descend underneath the sea surface under professional diving instructors' supervision, or try the Limnoupolis Water Park for an adrenaline rush on water slides. 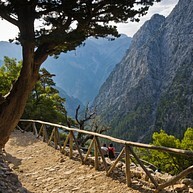 The Samaria Gorge trail is a definitive must-do for hikers, and culture vultures will have several small museums to choose from. 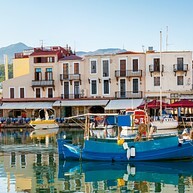 The harbour is hard to miss, being one of the attractions essential to Chania vacationers. Here, historic buildings are occupied by buzzing seafood restaurants and cafes, and a waterside promenade takes you on a journey through time - some parts of the fortifications date back to the 16th century. 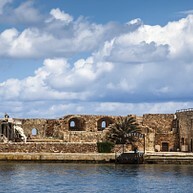 The calm ruins of Venetian defence structures remain standing all around the Chania harbour, with the best-conserved bit being the Western part of the wall. 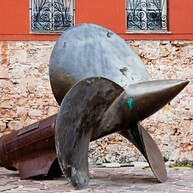 Its fascinating Naval Museum (next door) recalls Chania’s maritime tradition. The fortress is also where the Greek flag first was raised. Limnoupolis Water Park is a great choice for families with children - the park offers water slides of varying steepness, as well as a number of pools and a lazy river. 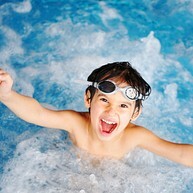 For grown-ups there is a Jacuzzi and a pool bar. Shops and eateries add to the water park's attraction. This famous 16 kilometre hiking trail down a spectacular mountain gorge runs all the way to the island's southern coast. You will need sturdy shoes, water and a hat to shield you from the blazing sun. Spending the night at the trail's end and catching a bus back to Chania the following day may be a good idea. Glass-bottomed boats cross crystal waters to nearby St Theodore Island, while others sail to idyllic Stavros beach on the Akrotiri Peninsula. Check around before choosing a particular company, as prices and routes may vary. A green area that spans nearly 20 hectares, the Botanical Park & Gardens of Crete provide a pleasant retreat from the summer heat. The territory is overgrown by multiple species of herbs, flowers, medicinal plants and fruit trees. The parks are also home to colorful peacocks and other animals. Maritime Museum of Crete is a great place to spend a couple of hours and get to know more about the island's nautical history. On the first floor, an educational film about Crete's past is shown. Sweeping views over the harbour and the lighthouse unfold from the museum. The permanent exhibition at Chania Archaeological Museum tells the story of Crete's history via multiple well-preserved exhibits, which include mosaics, jewellery, coins, sculptures, and other artifacts. The building itself served as prison, cinema, and ammunition warehouse at different times. Folklore Museum of Chania is a small but very interesting museum, which will most probably not take you more than an hour to visit. 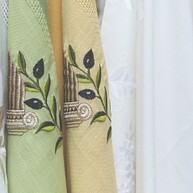 The museum showcases Cretan artwork and embroidery, paintings, handicrafts, and various traditional pieces found in many island homes. 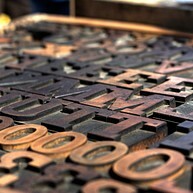 The Chania Museum of Typography traces the development of typography from the Gutenberg era until today. You will see different tools, objects, machines and prints which have been used throughout the making of contemporary print. Lectures and readings are held on occasion. Manousakis Winery is a beautiful and cosy little farm, ideal for a day trip. Get a cheese platter, taste some flavourful, fruity wine and simply relax in this lovely environment. The staff here is very friendly and you can buy the wines in the little shop on-site. 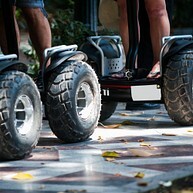 Discover Chania as a part of a fun, enjoyable activity - aboard a segway! Going on a Segway tour is a fun and easy way to discover the city. Both group and private, individually-tailored tours are available - around the Old Town, harbour area, the Halpea district, along beaches, and more. Doctor Fish is a lovely fish spa located in the centre of Chania. This is the perfect treat for your feet after a couple of days of walking and discovering the island. Experience the unusual sensation of fish gently peeling the old skin off your feet - all in a pleasant environment. Green Care Spa is a lovely, modern, and centrally located spa which offers customers all types of relaxation treatments. Especially popular is the Indian head massage but they also have waxing, pedicure, manicure, and other professional beauty and wellness procedures. The Municipal Art Gallery of Chania contains extensive collections of art by mainland Greek and local artists, donated to the museum by several private collectors and individual artists over the course of the past decades. A plethora of modern art is showcased here, and events are hosted frequently.